Coast Dental Peachtree City family dentist Yvonne Dorrian is raising awareness about the importance of detecting oral cancer early by offering discounts on screenings all month and highlighting the issue during a special event on April 28. Coast Dental offers oral cancer screenings. Oral cancer is on the rise and Coast Dental Peachtree City dentist Yvonne Dorrian knows that early detection can save lives. 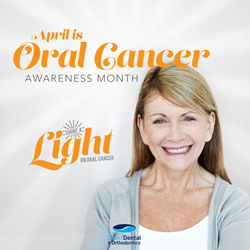 April is Oral Cancer Awareness Month and all month long Dr. Dorrian is offering discounts on oral cancer screenings at Coast Dental, located next to Target at 1207 North Peachtree Parkway in Peachtree City. Dr. Dorrian is also hosting a free seminar on Thursday, April 28 from 2 p.m. to 3 p.m. to talk about the hidden nature of the disease, risk factors, and early detection success stories. For more information or to RSVP, please call (770) 631-5062. Dr. Dorrian provides family dental services to adults, teenagers, and children as young as five years old. She earned her dental degree at Nova Southeastern University College of Dental Medicine in Ft. Lauderdale, FL. Dr. Dorrian is a member of the Georgia Dental Association, American Dental Association, and the Academy of General Dentistry. When Dr. Dorrian began practicing dentistry in 2003, oral cancer was not as prevalent as it is now. The fastest growing segment of the oral cancer population consists of sexually-active people between the ages of 25 and 50. That’s because oral cancer has been linked to two strains of the human papilloma virus (HPV). More than 48,000 people will be diagnosed with oral cancer this year. It’s one of the deadliest forms of cancer – deadlier than cervical, brain, ovarian or skin cancer. That’s because it often has no symptoms in the early stages when it would be easiest to treat. Because early detection is so important, Coast Dental supplements a conventional oral examination with Identafi, a multi-spectral imaging device that uses varying colors of light to detect abnormalities not visible otherwise. During the month of April, patients can save $10 on this quick, painless and non-invasive advanced oral cancer screening exam. * Plus, Coast Dental will donate one dollar from every Identafi screening to the Oral Cancer Foundation. When oral cancer is detected in the early stages, patients have a 90 percent survival rate. Call Coast Dental Peachtree City at (770) 631-5062 to make an appointment today. Early detection really does save lives. *Identafi special offer expires April 30, 2016. Full price: $70. Save $10. Cannot be combined with insurance or discount dental plans. Minimum fee only. Fee may vary with complexity of case. ADDITIONAL CHARGES MAY BE INCURRED FOR RELATED SERVICES WHICH MAY BE REQUIRED IN INDIVIDUAL CASES. The dentists and hygienists are employees or independent contractors of Coast Dental of Georgia, P.C., (Adam Diasti, DDS, DN11634).